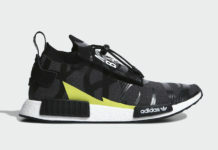 Three adidas NMD XR1 JD Sports exclusive colorways dropped today on Black Friday, November 25th for the holiday season. Different from Foot Locker EU’s Black Friday exclusives, these JD Sports releases come in ether an off-White, Black and/or Navy color options. They all includes a full-length White Boost midsole, perforated mesh construction and colored EVA insert overlays. Check out the three adidas NMD XR1 colorways below and find them all still available exclusively at JD Sports. The retail price tag is approximately $150 USD.